This past weekend, I celebrated my 25th birthday! Each year seems to go by more quickly than the last and I can’t believe I’m another year older again. I personally love birthdays because they are an opportunity to show the person you love how special they are and how much their life means to you. However, when my turn comes along, I always struggle to finalize my birthday list. Don’t get me wrong – this is definitely a good problem to have! Under Armour Fly-By Tank – I have had my eye on this tank for quite a while and will probably be purchasing it with my birthday money. It’s perfect for summer and comes in so many fun colors. MPG Cover-Up Cardigan – If I could wear running clothes to work everyday, I totally would. This cardigan makes that a little more possible. Just wear it with a tank and jeans and all you have to do is change into running capris (like the Running Skirts Honeycomb Capris below) and head to the gym. Feetures! Elite Cushion No Show Tab Sock – You might be thinking, “Really, Socks?” Seriously. I bought my first pair of these socks for my marathon and feel like they made a huge difference in how my feet felt. These are kind of expensive and a luxury many people wouldn’t indulge in, so I’d say it’s appropriate to give socks in this case. Your runner friend will thank you. FlipBelt – These come in so many cute colors and make it easy to carry personal belongings when running, biking, etc. lululemon Speed Shorts – lululemon is another item I consider a sweet luxury. These shorts will make the active girl in your life feel super spoiled. They even have waterproof pockets for your phone/keys and extra pockets for Gu’s/gels. Black is a safe bet because it looks good with everything. Brooks Special Edition Kaleidoscope Collection – If your runner has a favorite Brooks shoe, they just came out with this awesome Kaleidoscope Collection that’s only available for a limited time. We could always use an extra pair ;). 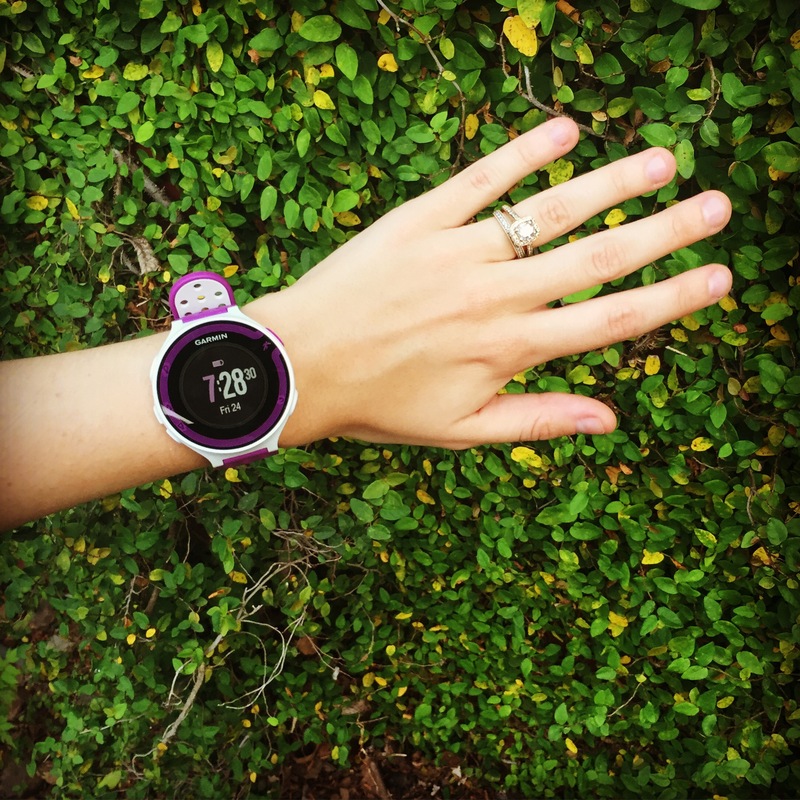 Garmin Forerunner 15 – The Forerunner 15 is a sporty and functional and will help her reach her time goals. This low priced GPS watch has so many great features that I can’t list them all here, so be sure to check out the list here. Sweaty Bands Headbands – Sweaty Bands have a no-slip grip and come in many fun colors. Again, you could get a basic color and wear these from work to the gym. Massage Envy Gift Card – Two words: Treat yourself. Massages make a great gift, and if you know someone who’s training for a race they’ll appreciate the chance to get a sports massage to work out their aches and pains. Running Skirts Honeycomb Capris – I just think this print is so fun! The light colors match pretty much anything and make this an option for the summer, since black absorbs heat. Wear them to yoga, kickboxing, or on an after-work run. As for my actual birthday, it was great. We relaxed, went to dinner and watched The Princess Bride. We also got to spend the day with my family a couple days after. Chris spoiled me and got me the Garmin Forerunner 220. I haven’t had a chance to try it yet but will provide a detailed review when I do. ← Yes, running a marathon will change your life. When was your birthday? Mine was on Sunday (10th). Happy Birthday!